Then he came back. Mason Cole offered a second chance to share the life we were supposed to have together. He gave me a glimpse of myself. The woman I'd forgotten long ago. Keep Happy is the first book in the Silvervale Second Chance Romance series by A.C Bextor. Once again Ms. Bextor delivers a superb story, that tugs at your heart strings and shows what a versatile and talented author she really is. Katherine Morris met Mason Cole when she was 12 years old. They developed a firm friendship, the more time they spent together, the more their feelings developed. But circumstances forced Mason to move away, leaving them both devastated. She does her best to live her life, but its never quite the same without him. She marries and has two adorable daughters. Her marriage isn’t what she had hoped. She is unhappy, and her cheating husband only adds to her woes. Then Mason returns to town and old feelings come rushing back. What does fate have in store for them? What about her marriage? Will they get their second chance at happiness, together? This is a great story, with wonderful, complex and conflicted characters. My heart ached for what they had been through and I was rooting for them the whole way through. The story has a great pace and a smooth flow. Its told from a duel POV, and the story moves seamlessly from past to present perspectives, to give us a better understanding of events. I will definitely be reading more of Ms. Bextor’s fantastic books. I wonder what she has got for us next? 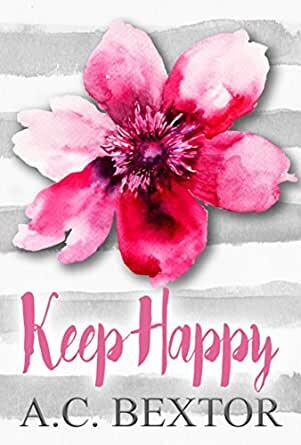 Keep Happy by A.C. Bextor ​is a love story that takes us on the journey in the life of Katherine and Mason. This story had me captivated from the very start as we follow their past, their present and their future. A.C draws you into this story and keeps you enthralled by her wonderful characters even though their story is a rocky road to true love. I loved the way story unfolded and the way it is told by taking us back and forth in years by reliving their past and bringing us to the present. Reading this had my emotions all over the place, frustration vs understanding, hate vs love, sadness vs happiness with a bit of laughter thrown in to lighten the load. Sometimes what seems the right thing, turns out to be the wrong thing. This is a must read. I will start off by saying OMG, this was an emotional and absolutely gut wrenching book. It shows Emotional neglect, loyalty, anger, kindness,hate, friendships, heartbreak, love, safety, selfishness and a way to be self aware. You see for every good there was a bad from beginning to end. In truth this book gutted me and showed me at a time in my own life that we all deserve more even as we all get older. Mason and Katie have circled or Loved each other for over twenty years. When they fall in love when she is old enough his abusive fathers ways sends him leaving and her into another mans arms. She loves her husband as a provider, a friend and mostly as the father of her daughters. Problem her husband isn’t faithful and she’ll always love Mason he’s her safety and the person who she always wants to share herself with but her daughters will always come before her own happiness. AC Bextor continues her heart wrenching way of writing in yet another book that is perfection from page 1 to the ending were I needed so much more. She could write this couple and these teen girls forever and I be so honored to read her words. I really enjoyed this book the writing is flawless it kept me engrossed throughout. I really loved the characters and the way they interacted with each other. This is a fun, hot, romantic must read book and I would definitely recommend this book to anyone. This is a truly emotional read full of first loves, lost loves with devastating heartache, unconditional parental love and a second chance that leaves us with and HEA in the end. Mason Cole is true alpha all the way, from the very young adult when we first meet him. He had a unexplained need to look out for Katie, make sure she was treated right. A man with a undesired upbringing determined to be more than the man who was his role model. His love for Katie was all consuming, but sometimes love doesn't happen at the right time and life gets in the way. Katherine crushed on Mason as a young teen, years of friendship turned to a beautiful love. Life circumstances send Katherine on a different path. Loneliness and longing seem to be her norm these day. Thankful for the love of her children to keep her going. Is there a possible chance for a second chance at the love they once knew? Is it possible to be Happy finally? A.C. Bextor has made be a believer that for the right story, continual moving from past and present can work beautifully. If the story was told in sequence of events, the same impact would not have been felt by the readers. Please don't let this hold you back as this is a wonderful book that should be read. The story Keep Happy by A.C. Bextor is a wonderful romance book. It is a story about two people who fell in love with each other and how even though they had an amazing bond their lives each took a different path. Their attraction and intense feelings for each other have never changed. Will they get a second chance together? This is a story that hooked me in from the very beginning and I didn’t want to put down until I had finished the last page. It had my emotions going up and down all throughout the book. There are times what I read had me frustrated, sometimes angry at situations that are happening, however, there is also the warm feeling that I get reading about two people I felt are meant to be together. I was always rooting for them to get an HEA. I loved the character of Mason Cole. He is a handsome man and he can have any woman that he wants. All he has ever wanted is one. Mason was a troublemaker when he was younger however now he is someone that helps out in the community through the job that he has and also volunteer work. The woman that Mason is in love with lives a life that is lonely and the face she wears hides what she truly feels. She is proud of her two daughters however you can tell that she doesn’t have the life that she has always wished for. What does the future hold for these two? This story is told from a duel point of view. It has plenty of steamy scenes that makes the temperature in the room rise. Have a cold glass of ice water ready. I highly recommend this book. I have read other books by this author and have never been disappointed with any of them. I can’t wait to read what she writes next. Keep Happy by author A.C. Bextor is the story of Katherine Dyer and Mason Cole. Katherine met and fell in love with Mason Cole when she was twelve and he was twenty and that love she never lost. Mason is a guy who has never had an easy time yet when he meets Katherine he’s drawn to her sweetness and as the two become adults he becomes more protective. Fate intervenes and the two are separated. Katherine marries and Mason lives his life in a new location. Eventually Mason comes back to his hometown to find that he is still drawn to Katherine. Will they find their way back to each other? I have read other stories by this author and I have to say this has to be one of my favorites. I loved the rapport between Katherine and Mason. He was such an alpha right from the beginning and he just wanted to take care of Katherine but didn’t want to “ruin” her life. The secondary characters were so realistic I felt like I personally knew the. My favorite though has to be Katherine’s youngest daughter, Averie. Her conversations with “McButterpants” had me literally in tears of laughter. If you are looking for a good story with heart I definitely recommend Keep Happy, it will make you happy.